I'm seeking a Mac app for creating basic flowcharts and similar diagrams. Google has been no help; I've followed dozens of links to apps that either don't exist anymore, I can't find any real reviews of, or that won't run on OS X 10.6.6. I wouldn't actually use it for flowcharts, but rather basic similar diagrams to show data flow between apps, information flow in a company or other places, that kind of thing. I recently found out that the drawing portion of Google Docs actually does a pretty good job with the types of diagrams I need to create, but the UI is pretty poor and it obviously requires a constant net connection. If you can stretch your budget, get OmniGraffle for Mac. At $100, it's pricier than you'd like (do you possibly qualify for the $60 edu price? ), but it's exactly what you're looking for. On the lower end there's Mindcad Incubator for $50, but I haven't tried it myself and I'm not sure it does everything you want. For free online diagramming there's draw.io, which I co-author. The U/I is simple and clean. It supports the automatic connection and dragging of components you're looking for. Also, it's free (and open source), which meets your under $30 requirement. There is also a Desktop version available. The Google Docs suite of tools now has a diagramming tool that lets you create flowcharts. While not as feature rich as something like OmniGraffle, it does cover all your requirements: simple & clean interface, basic shapes (and not an overabundance of shapes), automatic connectors with elasticity, and it meets your price point at free. Certainly can't hurt to try it out before you drop $100 on the Mac Daddy of diagramming programs for Mac. Edit: just noticed your last paragraph in your question. Not much I can do about the UI, but I will mention that offline support is about to make a return via Chrome. I found another one. Seems to meet all your prerequisites. Shapes is a simple, elegant Graphing and Diagramming app for Mac OS X Snow Leopard. Shapes gives you all of the most important features you need in a Diagramming tool without all the extra cruft, and without breaking the bank. Dia is pretty useful. From the description: "Dia is a program to draw structured diagrams". Available for Linux, Windows, OS X. The link above is to a GUI wrapper to the command line utility. With GraphViz, layout is automated, so you don't get to choose exactly where the nodes end up, although you can provide hints and have some limited control. Connectors are automated and will stay linked (although you can't move shapes with a mouse). I'm late to the party, but NeoOffice's drawing tool meets your four criteria. How about pencil? This is for fast prototyping. I know this is an older thread, but I would like to throw in my $.02 (since things have changed some since this was posted). Lucid Chart for Google Apps is a viable solution. 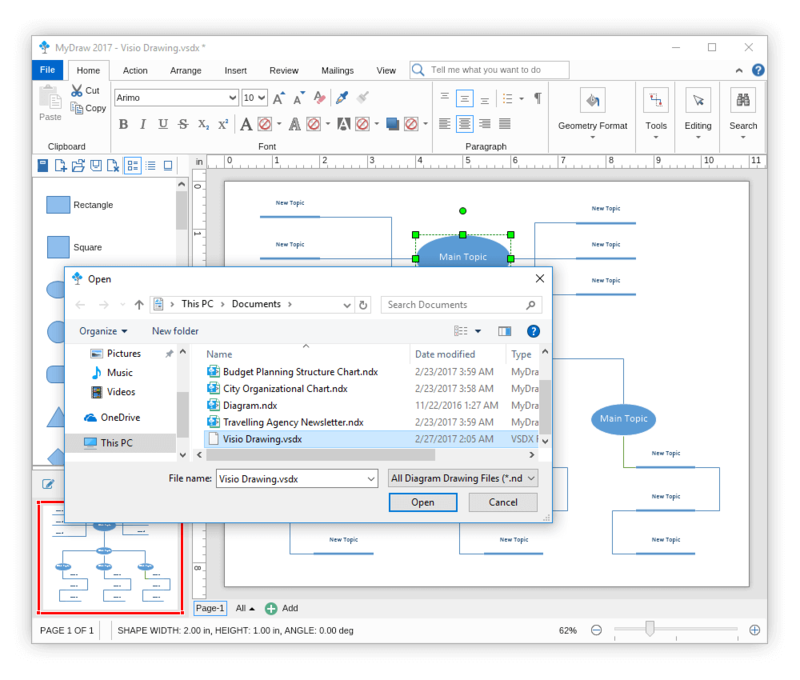 It is free for basic diagramming, and there are very reasonable pricing for more advanced features. It even has the capability to open (and save) Visio documents. It is integrated with Google Drive (for personal OR Apps Domains) and is real-time collaborative. Google Docs, of course, has a Drawing tool, but Lucid expands on it with some drag-n-drop features and other more advanced tools you would expect from fat-client apps. more information can be found on their website but if you search in the Chrome Web Store, you will find it and can install it directly from there. At that point it is as simple as logging into Google Drive and clicking Create and selecting Lucid Chart as the document type. Apple's Keynote may primarily be for presentations, but its diagramming tools also hit all your requirements: simple interface; polygons of arbitrary number of sides; connection lines (select two shapes, right click, "Add Connection Line"); cost of USD$20. As a bonus, you'll have great presentation software to show off your cool new diagrams. Would MindNode fit what you're looking for? There's a free version and and $20 version available. They're both on the Mac App Store. I love Gliffy. It's free and very user-friendly. You also have several proposals from another SO thread here. OmniGraffle won the competition but the other links are quite interesting and could fit your needs. Give Xmind a try. It's Java, so expect a Java applications… if you know what that means. But given that you haven't found OmniGraffle very "attractive" for you, you might want to give it a try. There is new diagramming tool Diagrammix in the Mac App Store. Simple and beautiful. Creately has an improved interface and I can assure you that it is very user friendly powerful and simple. Yes, Creately supports 1000's shapes since there are more than 50 diagrams types made available to use. And you can customize to use the ones you want to use frequently as well. Creately has what you call (smart connectors) that can automatically connect shapes by identifying the position of the shape and the connector type it requires. You can edit change / add different styles and improve your diagrams with creately as you want. Its a fully fledged diagram designing application made for diagramming mainly focused on the design and use. It has specific features for each diagram type. Perfection is the word for the diagrams you design from creately. Further more there are many templates and examples to be used to create instant diagrams. Price is under 50$ as you mentioned and the whole package is worth it. You can always try be for you buy. Import and export to Microsoft Visio. 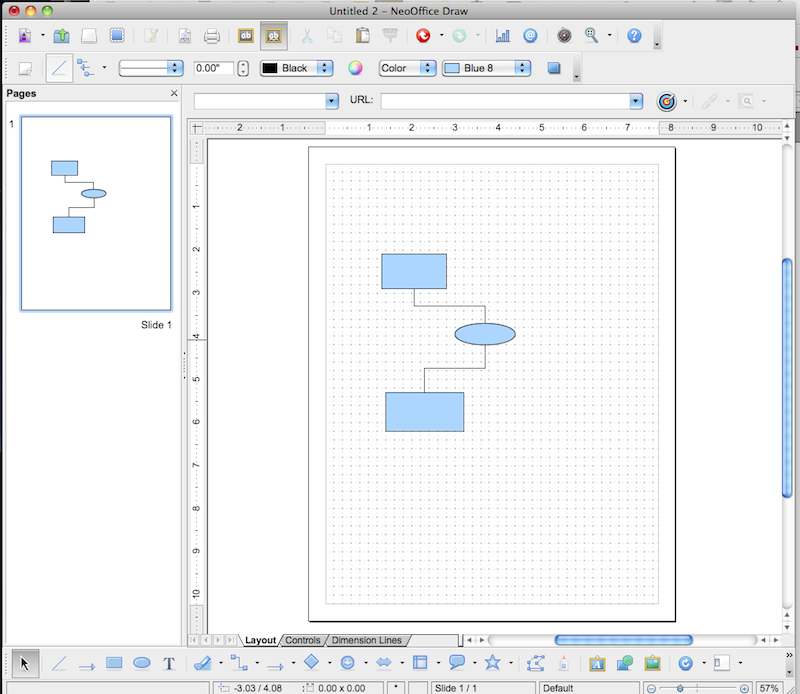 Highly interactive, fast and modern User Interface that is Visio like. Support for embedding barcodes (and soon charts, gauges and tables) in drawings. Export to vector formats like SVG, PDF, WMF and DXF (Autocad). Export to raster formats like BMP, PNG, JPEG and other. IHMC CmapTools is very good. You have to register for it but it is free to use and can run on all major OSes. Your best solution is probably Inspiration. There's a free trial version available you can try out. Since what you're asking for is an extremely simple to use program without advanced features and lots of shapes, I suggest Delinieato, available through the Mac App store. Delineato gets ideas out of your head and onto the screen with a few clicks. It includes specifically the features you asked for, simple shapes, easy to use connectors, connectors that flow with the shapes as you move them around the screen. Delineato also has an infinite sized canvas, allowing you to shift things around and expand ideas as neccessary. Best of all, it's under $10 on the App Store for the full version. A cross-platform desktop application that is available for Linux, Mac & Windows, as well as an online edition & iPad edition compliments its versatility. This is a Premium application and the price varies depending upon which version who choose to purchase. I'm really liking Gliffy. I'm a long-time user of Graffle and have tried a number of the other suggestions on this page. Graffle is great except for one crucial, deal-killing problem - it's orthogonal connecting line algorithm is terrible. I have to manually redraw lines almost anytime I move anything. Gliffy is completely intuitive - everything pretty much does what I expect it to, and there are nice keyboard shortcuts for most things. I'd like to see symmetrical resizing (hold down option like in Graffle) so I don't have to re-center every time I resize a box, but that's a niggle. The one feature I'd really like that none of these programs seems to have is the ability to expand or collapse a process block to reveal the flowchart of what's in the box. MacFlow under Mac OS9 used to do this, and it was wonderful: double-click a box and a new page would open, where you could flowchart the "nested" process. Close that window and the chart is hidden, but still there underneath whenever needed. Boxes with nested flowcharts had a bold border around them to let you know. The ProcessOn diagram platform is completely free, and includes a drawing application that is actually fairly useable for creating diagrams and flowcharts at the simpler end of the scale. Why does nobody mention the excellent diagramming app - ConceptDraw? If you're familiar with Microsoft Visio, this one is absolutely your choice. The only one problem is that it's more expensive than what you expect. Hope you can have a trial and consider my recommendation. You can actually do a lot of flowcharting stuff with Google Docs too. It depends on whether you're willing to pay for something or not. There's a good mix of both paid and free flowcharting software on Mac here. Export to PDF, JPEG, PNG, Word, PPT, Html, PS, Visio, etc. Support 260+ kinds of diagrams. Add hyperlink, attachment, note and comment. 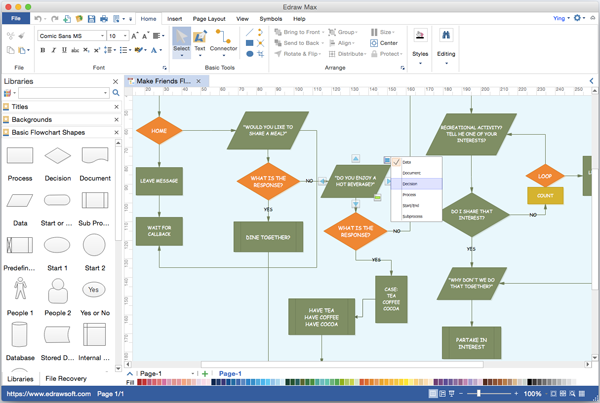 Support large flowchart and multiple pages drawing. Not the answer you're looking for? Browse other questions tagged macos software-recommendation ui drawing . What OS X app can I use for wireframing? Can anyone recommend a programmers' editor? Can you recommend an editor for both iOS and Mac OS X designed for writers? Generating and collaborating on network map diagrams? 3D modeling application for Mac? Is there a full-featured Mac email app that natively implements labels (instead of folders) and archiving? Can anyone recommend a stop watch or timer which stays always on top?